I really should be doing other things, but tonight I tagged this up. 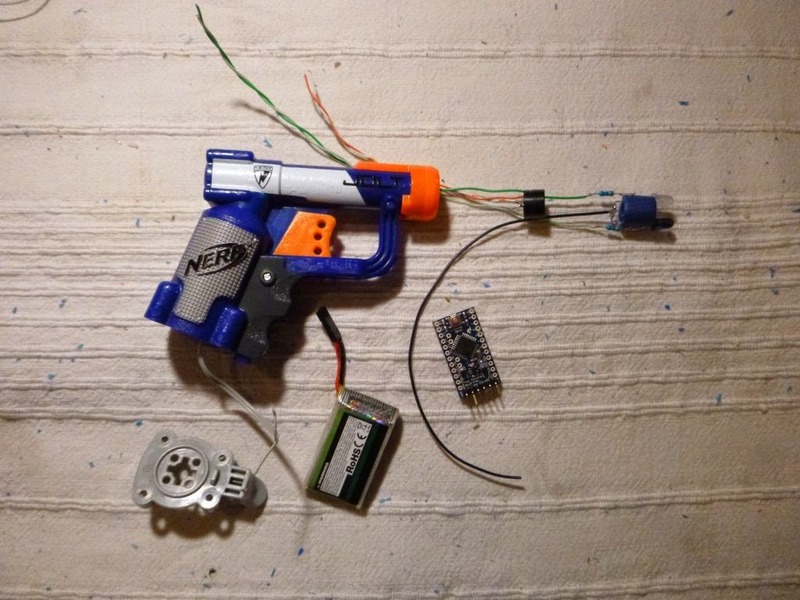 This Nerf Jolt is now a very basic but functional Lasertag gun. I've been asked to make a pair of concealable 'assassin weapons' for a game and although I don't have the actual gun board yet I wanted to mock it up with what I have because I'm impatient. 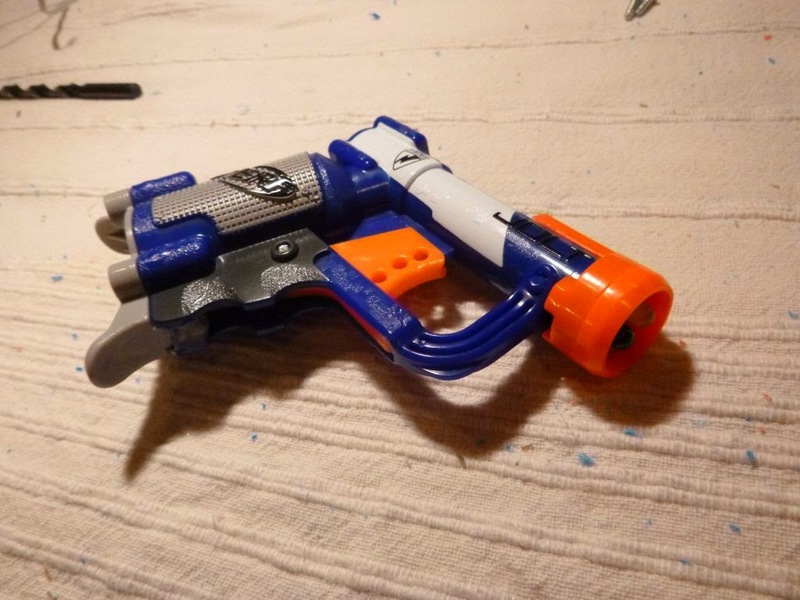 I ripped all the Nerf internals out, including using a drill to destroy the one-way valve mechanism at the back of the barrel. Then I fed this lot in. I've got a TSAL6100 IR emitting LED, 5mm white LED, small piezo sounder, Arduino Pro mini and a small LiPo battery squeezed in. I'm actually using a 5V Arduino Pro mini at 3.7v but it seems to work fine. I've got a 3.3V version on order, but like I said I was impatient. With a very basic sketch loaded up it lights up the muzzle flash LED, makes some white noise then emits a simple tag hit with IR. What it lacks at the moment due to lack of space is an on/off switch, charging jack and reload button. It just fires repeatedly and you have to take the bottom cover off to disconnect or charge the battery. For what this is intended for these limitations aren't huge. It's aimed at a four hour indoor LARP where it'll be hidden on somebody and maybe not even used. I could go with a smaller LiPo and then maybe be able to fit an on/off switch, again I just had this one kicking around. What I definitely need to do though is stick the IR emitter in a piece of tubing to constrain the output. Right now it hits everything in front of you, and I mean everything. Reflection isn't noticeable indoors, I've put a fair size resistor on the emitter and it's driving straight from the Arduino so quite current limited.